Friday fun poll: on all-door boarding routes, do you board through the front, middle or back doors? A lineup for the 99 B-Line at Commercial-Broadway Station. On January 1, we began piloting all-door boarding on the 95 and 96 B-Lines, joining the 99 B-Line and 145 (at select stops) as all-door boarding routes! This allows customers paying with their Compass Card to board the bus through the front, middle or rear doors. You choose! Which door do you usually board from? During my days as an SFU student, I was an everyday commuter on the 145 from Production Way–University Station. My door was the rear and still is today when I take an all-door boarding route. I observed most passengers who boarded through the front and middle door moved as far as the bus’s articulated joint. That meant two lines were merging for the front half of the bus, while it was only one line for the back half of the bus. It felt like I was able to board the bus sooner from the rear. Have you observed the same thing as me? Which is your door and why? Let me know by casting your vote and leaving a comment! On all-door boarding routes, do you board through the front, middle or rear doors? Did you ride the 95 or 96 B-Line during the all-door boarding pilot? 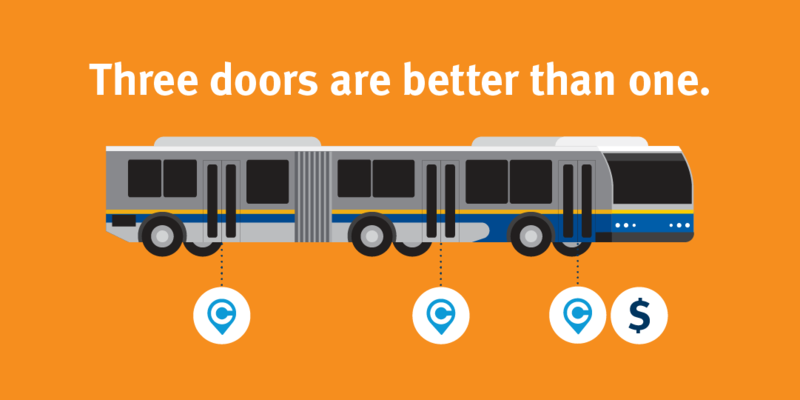 Let us know about your experience at translink.ca/alldoorboarding! In our previous poll, we asked you whether you preferred a window or aisle seat on transit and the results are in! Seventy-six per cent of you preferred the window seat. Calling all 95 B-Line SFU/Burrard Station and 96 B-Line Guildford/Newton Exchange users… this one’s for you! Beginning January 1, 2018, when boarding the 95 B-Line or 96 B-Line you’ll be able to pick a door, any door when boarding the bus! That’s right, we’re piloting all-door boarding on two additional routes in the New Year.